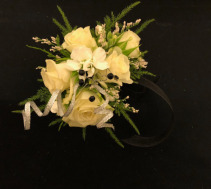 This customizable wrist corsage features all white spray roses with white stock blossoms; accented with silver accent ribbon curls black crystals and white limonium. Call the shop at (208)323-7738 to customize and place your order! This customizable wrist corsage features red spray roses, black sheer ribbon and is accented by seeded eucalyptus and white limonium. Call the shop at (208)323-7738 to customize and place your order! 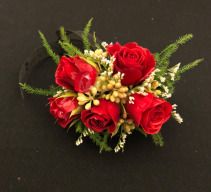 This customizable red rose wrist corsage features 3 blossoms of red spray roses for a more round and petit style. 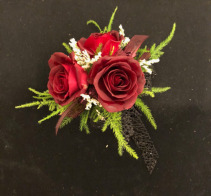 It is accented by glittery black ribbon, burgundy color and burgundy accent ribbon with white limonium. Call the shop at (208)323-7738 to customize and place your order! This romantic mix of burgundy spray roses, white alstroemeria and gold accents creates a stunning accessory for the evening. Call the shop today at (208)323-7738 to order and customize to fit your colors! This pink and white mix of spray roses and alstroemeria is a soft look for Homecoming, Prom or any special occasion. This corsage is slightly more round than our other corsages giving it a petit look when wearing. 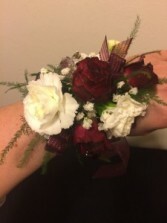 Call us at (208)323-7738 to order yours today and ask how we can customize this corsage for you! **certain flowers/colors may not be available at time of purchase. Please ask our staff how we can customize to fit your needs. A lovely mix of creamy white spray roses and white alstroemeria makes the gold accents pop! This wrist corsage is an elegant mix of purple accent and gold glitter ribbon. Call the shop at (208)323-7738 to order and see how we can customize this to fit your colors! 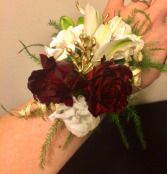 A classy night out on the town all in a wrist corsage! Ask our staff how we can personalize color to match the dress or the event! Call our shop today to order at (208)323-7738. This romantic corsage is a mix of dark burgundy spray roses and white mini carnations for a softer look. Accented by white filler, Silver Crystals and burgundy pinstripe ribbon, your sure to make a dramatic entrance with this accessory. Call the shop at (208)323-7738 to order and customize to better fit your colors! 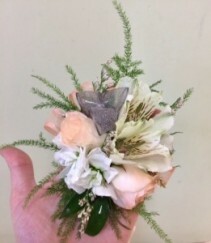 *Baby's breath is shown as the filler in this picture but may not be available at time of order. Please call for details. 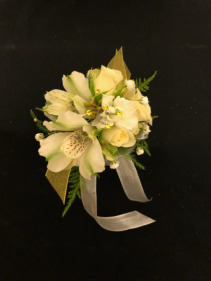 This customizable wrist corsage features white spray roses and white alstroemeria (peruvian lily) with accents of yellow ribbon, metallic silver ribbon and baby's breath. Call the shop at (208)323-7738 to customize and place your order! **Baby's breath may not be available at time of purchase. See our other pictures for the usual type of white limonium filler we use. 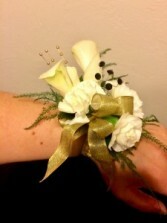 This black and white wrist corsage is sure to create a stunning accessory to your dress. 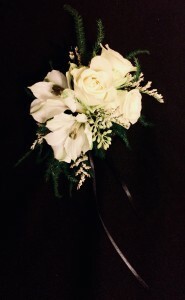 This mix is elegant with creamy white spray roses, white alstroemeria white filler to pop against white ribbon accents. Call us at (208)323-7738 to order and customize colors to fit your needs. 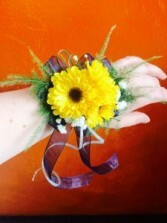 This Bright wrist corsage features Viking Mums for a sunflower feel. Accented by dark blue and silver ribbon, this is a great accent for a rustic or bright and elegant feel! 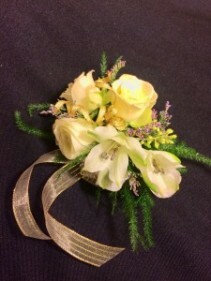 Call the shop at (208)323-7738 to see how we can customize this corsage for you! *availability of certain items in this corsage vary depending on weather, season, etc. Please call for details. Get a keepsake that will last forever! Great for Prom, Homecoming and even weddings. 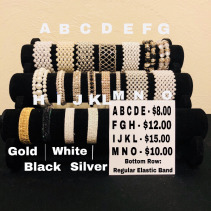 The letters above the top row and below the middle row represent the specialty keepsake bracelets available to add to your order. The four elastic bands on the bottom row are our standard bracelets used for corsages. Call the shop at (208)323-7738 to add to your corsage order! Is your style classic elegance or glitzy glam? Whatever your style, let HEAVENESSENCE FLORAL & GIFTS create a one-of-a-kind prom corsage to enhance any dress. Whether it's for youself or a date, we are here to help you choose the right colors and flowers to create the perfect corsage for you!